An Ontario apartment home in one of Southern California’s coveted neighborhoods can be yours today at Camden Landmark. Our one and two bedroom apartments are designed with classic style, convenient upgrades, and the perfect view of the beautiful San Bernardino Mountains. Through your front door high-ceilings framed with crown molding flow into the kitchen, living room, and dining area set in an open-concept layout – the perfect blank canvas ready for you to make it your own. The kitchen offers plenty of counter space and storage with custom cherry-finished cabinets, black appliances, kitchen pantry, and more. Our apartments are crafted with features inspired by the easy-going SoCal atmosphere balancing style and convenience with double pane windows for natural lighting, full-size washer and dryer inside each apartment, electric fireplaces, and large walk-in closets. Select apartments even have attached garages, carports, and private entrances with large balconies. We love the year-round sun just as much as you do and many of Camden Landmark’s amenities make it easy to soak up Vitamin D! Every day could be like a vacation by the palm-tree lined swimming pool and hot tub. Family and friends will love picnics in our outdoor picnic area with BBQ grills, the onsite playground and friendly competition with a (mini) golf game on our manicured putting green. The outdoor living room with a large fireplace is perfect for those cool California nights as well. At Camden Landmark we want your pets to love where they live too - our pet-friendly community has beautifully manicured walking trails perfect for afternoon walks with your dog. Need to work out or get some work done? Take advantage of the 24-hour fitness center with treadmills, free weights, and more then head to the executive business center with complimentary Wi-Fi. Access to our gourmet coffee machine also means free coffee and refreshments whenever you like! Inside the clubhouse we have a resident lounge perfect for entertaining guests with comfortable seating, a large flat-screen tv and complimentary WiFi. If you’re looking to live like a true Southern California native, Camden Landmark’s location in the middle of San Bernardino will make it happen. The Inland Empire’s most popular destinations are only minutes away. Our expansive technology package includes Verizon FiOS Prime HD Internet and Digital Cable with 280+ channels, plus 80+ HD channels. Take advantage of WiFi with speeds up to 50 Mbps and brand new video programming on the go with the FiOS TV Mobile app for your tablet or smart phone. Your equipment includes one HD set-top box with remote control and one wireless router, all for a Camden resident-exclusive discounted rate saving you up to 41% annually! Schedule a tour today and come home to Camden Landmark for that Southern California apartment you’ve been looking for! Each apartment home receives one assigned carport or garage parking space. 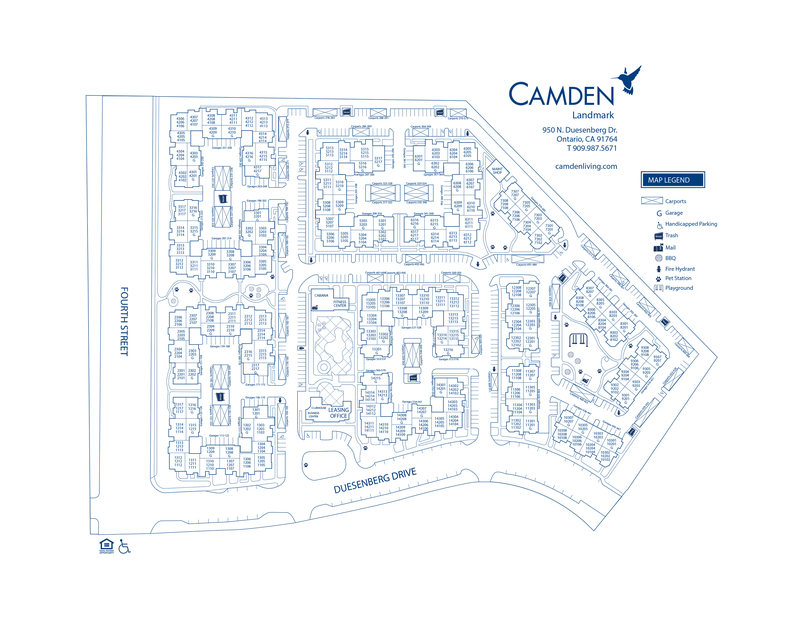 One Camden permit will be assigned per lease-signing adult with a maximum of two per apartment home. Guests can park in visitor parking with a guest permit. All parking is first-come first-served and residents can print 2 guest permits per unit within a 48 hour time frame.